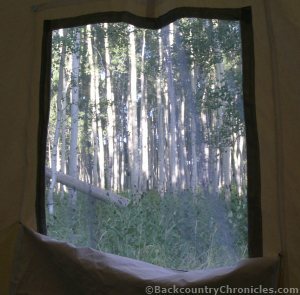 Several years ago, we decided a wall tent might be a good alternative to sleeping in the back of the truck or in our backpacking tents, especially in cold weather and when we planned to sleep near the truck anyway. Of course, we enjoy the comfort of sleeping in a nice, heated camping trailer, but sometimes it is a lot of trouble getting a trailer in and out of some of the rougher Forest Service and BLM roads, especially later in the hunting seasons after the snow starts to pile up. Our 12×14 wall tent gets us into the backcountry where no trailer can. I’ve seen two separate Elk seasons in the last 10 years where many hunters spent days trying to get their trailers back off the mountain after snow storms. Many roads were so blocked with traffic coming off the mountain that other hunters couldn’t drive up the mountain. I was glad not to be involved in that mess. We went hunting while many people were directing traffic. Every year, anyone taking a trailer into the higher elevation mountains between mid October to mid November is taking a chance that their trailer will spend the Winter on the mountain. This is not usually a problem if you stay close to the major roads, but who wants to camp near the major roads? During that time, it’s important to pay close attention to the weather forecasts. It seems that our plans for where to camp and where to hunt are altered by snow storms almost every year, especially for the muzzleloader elk season that starts at the end of October or early November. In fact, as I wrote this, we were planning for a hunt that started in early October and it’s was snowing outside. A few days earlier, we were hunting at 9,400 feet on dry ground, but there was at least a foot of snow up by then. I was be able to drive back up there after a few days, but I didn’t see any more trailers hauled up there again that year. At the time we were considering a wall tent, we didn’t know anyone that had one, so we researched the costs and the options to consider, made our decision and bought a wall tent. Here is our wall tent buying guide based on our research. Tent has two screened windows that shut with an attached canvas flap held with velcro. Our tent is a 12 x 14 feet and 5 ft high on the sides and 8 ft high in the center. The tent has one door, a sewn in screen door, two windows and a stove jack (fireproof fiberglass hole for smoke stack) and a set of frame angles for a 4-rafter internal frame. We decided to buy the stove separately. We got lucky and found one for sale (still in the box) by a local person. The tent weighs about 60 lbs and including the 12 internal frame angles, 25 poles, stakes and rope, the entire weight is less than 100 lbs. Even including the stove (42 lbs) and stove pipe, the total load is less than 150 lbs, so it everything easily fits in the back of the truck and would even fit in the trunk of a mid-sized car. So anywhere the truck can go, the wall tent can go. When motivated, my wife and I can set the entire tent up in about 15-20 minutes without the stove and about 20-25 minutes including the stove and stove pipe. The most time consuming part is the assembly of the internal frame. The frame angles are attached to poles that connect to other frame angles. The poles simply slide into the frame angles and are held in place by friction. After trying the “trial and error” method several times, I finally wised up and marked the angles and poles with colors and symbols to speed up the assembly process (see Figure 2). I used blue for all the ridge pole pieces, white for all the pieces on one side and black for the other side. I also put the number “1” on all the angles and poles on the first rafter (door end), an “X” on all the parts for the 2nd rafter, “O” for the third rafter and the number “7” for the end rafter. Yes, I made a cheat sheet in case I don’t remember. Figure 2. shows the white paint and “X” indicates these pieces make up the 2nd rafter on one side. First step, is to assemble the internal frame except for the legs, then the tent is pulled over the frame. Next, one side is lifted at a time so the legs can be attached to the frame. The tent is then “squared up” and staked down at the corners first, then along each side. We have set the wall tent up faster than I have seen some people level their trailer. After the tent is set up, the floor (tarp or ground cloth) is rolled out and the cots and table are set up. If we want heat, we set the stove up under the stove jack, join the sections of nesting stove pipe, which are held by friction pressure and slide the stove pipe through the stove jack in the top of the tent and attach the stove pipe to the stove. That’s all there is to it, Home Sweet Home as long as we need it. No question, our wall tent is much more spacious and comfortable than our backpacking tents. We never used the larger family style tents, but the wall tent has the advantage there also because of the ability to use a wood stove for heat and hot water. 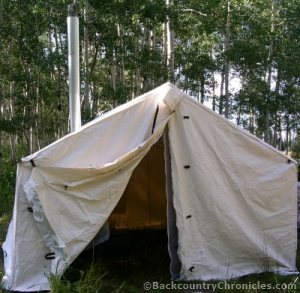 Is the wall tent better than a trailer? Well, that depends. More comfortable? No, not really, but it is comfortable enough to go out in bad weather and enjoy the trip. Is it easier to pull on bad roads or bad weather? Absolutely! And we still have money left in our pockets after buying the wall tent and stove. Easier to haul on bad roads – If the truck can go, the wall tent can go. If you can think of more advantages and disadvantages, let us know. Our 13X13 Elk Mountain Wall Tent. 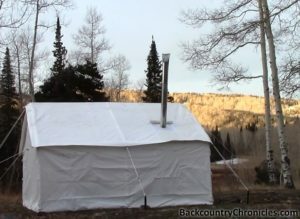 We now have a 2nd wall tent from Elk Mountain Tents. By having two tents, we can accommodate extra family members or friends and not be overcrowded or give up our privacy (or theirs). Look at all the room available for our two cots and the wood stove. Here are a couple of recent photos taken during a late Fall hunting trip. It is amazing that we didn’t have snow on the ground, but it was still cold enough at night that we enjoyed having the Cylinder stove. The Elk Mountain tent and frame is so much lighter, we find it easier to pack and to set up when we don’t have an army to help, especially when it’s just the two of us. Look for a full review in the future. Q: Are you thinking of getting a wall tent? What are your concerns? Let us know below. 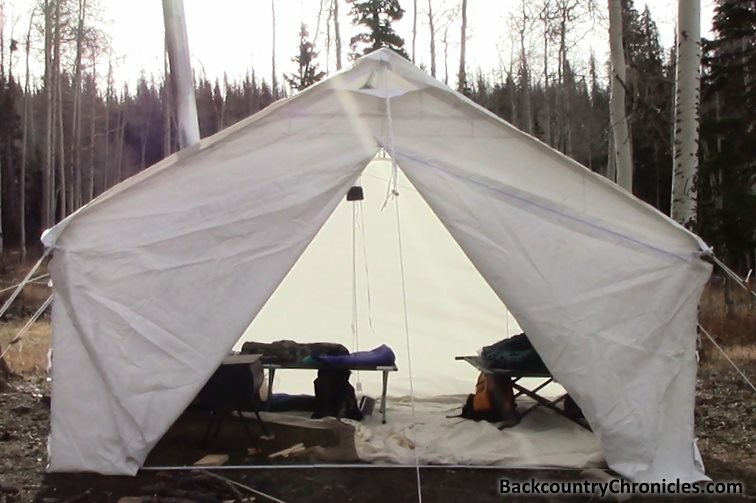 Wall Tent Internal Frame – How Many Rafters? I agree. Wall tents are great, trailer tents are great too. You just have to choose the one that suits you most. This post is highly informative! I like this! Wall tents and trailer tents happen to be 2 of my favorite camping companions. My family has tried both and both worked as well. Thanks for sharing this awesome post! I am trying to find or create walls for one of the 10×20 white ‘Menards’ style canopies. Do you know where I can find instructions to build / sew / etc. 10×6 ft or so walls so I can add screens and such to them. The canopy tents are not designed for this, but we figured we use one already for a number of uses so to add some walls, etc and we can either tent camp or just use for a backyard BBQ. Chris: I don’t know of any such plans, but I like the way you think. Tent material is usually heavy weight (10 oz or heavier) double-fill cotton army duck canvas. I have sewn this kind of material before and can tell you it is tough to sew by hand or requires a heavy duty sewing machine. This material usually comes in 5 foot wide bolts, so to make a single 10 ft wide panel, you would have to sew or lace two pieces together. The cotton duck usually comes in a natural tan color, which will not match well to your white canopy (if that is important). Cotton tarps or drop cloths are available in many sizes such as 10×8 foot or 12×10 foot, but they are lighter weight material, not waterproofed and the “white” tarps are not very white. The sizes may also be a few inches short of the advertised size, especially for tarps with grommets. For your 10×6 foot wall, consider at least a foot of overlap on the ground to overlap with a ground cloth. More overlap (18″ – 2 feet) is better, but adds extra weight. Last thought is some of the canopy frames I have seen seem a little fragile to me compared to a wall tent frame. If you enclose the walls, that will create a huge surface area for the wind to push against, so make sure you have plenty of rope and real stakes (not flimsy aluminum or tiny plastic stakes) to anchor the tent. In another post, Charlie made a comment about using auto shelters instead of wall tents. I thought the same thing when my neighbor got one for his Jeep. They are cheaper than wall tents and are available as full shelters that could be used for sleeping. They are also available as canopies or even screened canopies for cooking and eating. We have been in the search for a wall tent. We have narrowed it down to the Davis Wall tent and the Elk Mtn wall tent. They both have their pros and cons. I just read about your wall tent experiences and wondered what your first tent was and how you liked your Elk Mtn tent. If you would be willing to share with me your pros and cons from the Elk Mtn tent that would be great!! One question I have right off is the velcro corners. Have you had any issues with them? Any other concerns with it? We are looking to seal the deal this week on one so any feedback would be much appreciated. Thanks in advance. Hi Ethan: I’m not sure who made my first tent. There is no name sewn or stamped on it and the original website where I bought it is no where to be found, but it is a traditional canvas duck tent (12 x 14 ft) with one door (with mosquito net) and two windows. The Elk Mountain tent is definitely made of a lighter weight canvas, but it is actually stronger than the traditional canvas duck material. I am planning or writing a review on the Elk Mountain Wall tent, so I asked the guys at Elk Mountain for some info about the tent material. I want to save that information for that post, but the data show the fabric is stronger. As for the velcro corners, they hold together well. At first, I was thinking it was unnecessary to have open corners that had to be closed, but after comparing the setup to my other tent, it may be simpler. Also remember the canvas duck material will shrink. You will have to guess how much or you will end up cutting your poles again. If your tent shrinks, it may rip in those corners. I planned for 3% shrinkage for my canvas tent, but it never shrank that much, so my poles are too short. Shrinkage is not much of an issue with the Elk Mountain Tent. Over time, velcro tends to catch dirt and trash so it doesn’t hold together as well, but I don’t think that will be a problem on the wall tent. Most times when we use velcro items, we open and close them thousands of times. How many times do you really think you are going to set up your wall tent? Dozens? Maybe, but not hundreds? The Elk Mountain tent has big, heavy duty velcro strips. I don’t think they will every wear out, plus there are also ties for each corner. With my first tent, I went overboard on the internal frame to make sure it would hold up against the snow. Truth is, there is almost no amount of framing that will not collapse if you were to leave a tent up for the winter. So I have extra frame connectors and poles (extra weight and setup time), which isn’t necessary. If you are out camping and it snows, shake it off. Read the comment (found at bottom of page) to Geoff here about snow loads. The elk mountain internal frame system is very light weight, but is strengthened with cables. I also find it useful to hang a light from the cable. I have a piece of the Elk Mountain Canvas that I have been testing outdoors. I nailed the fabric around a post so it gets cooked in the Sun on one side and holds moisture on the other. It still looks brand new. No mildew at all on the shady side. The only con I can think of with the Elk Mountain tent is the fact that the windows have to be opened and closed from outside. If you wanted to open or close a window in the middle of the night, you will have to go outside to do it. While that may be inconvenient, the reasoning behind it is sound. Since the flap covers the outside, driving rain does not come in and the wind does not force the widow to billow inward. So if I knew I would never be camping in a hard driving rain storm, I would prefer window that open from the inside. Either way, I’m sure you will enjoy your new wall tent. I don’t know anyone at Davis Tent, but I have talked to and corresponded with the guys at Elk Mountain Wall Tents many times. It appears to me that wall tent camping is a longer term option. Is a wall tent sensible if camp is to be moved every 3-5 days? Generally yes, wall-tent camping is more for long term, but it is not really the tent that makes that true. If you are camping in an area where you can drive, then it just depends on how much other stuff you take with you (tables, chairs, coolers, stoves etc). If you have an internal frame for the wall tent, one person can set up the frame and wall tent in about 15 minutes (if frame parts are clearly marked for quick assembly), so setting up a wall tent is not much more time consuming than any other large tent. Breaking it down is even faster if the stove isn’t hot. If you are packing in with horses, then yes, you will probably think long and hard about moving camp. If you are using poles and ropes instead of an internal frame, it takes longer to set up, especially if you have to find, cut, haul poles to the site and lash them together. Thank you. Good points. Our use will be camping in areas where we drive, making camp for short periods of time (2 to 5 days, maybe bit longer) and then moving on. The reason for the tent is for the two of us to travel the country in our recent retirement. Therefore, I need to incorporate a level of comfort and practicality into this. We tried hotels and hauled campers behind the truck and both have advantages and disadvantages. As a geologists, hotels are often not where we want to be, are pricey and boring, and travel campers cannot often get there. We will take all we need including a generator, so to your point, there will be extras in addition to the tent. Our day excursions are hiking and photography, occasionally leave camp and backpack into more remote locations and return next day. I have no experience with canvas wall tents but appear to be a practical option. Thank you for the input. Yes, wall tents are a good option for the type of camping you want to do. 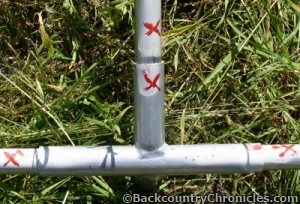 You will want an internal frame and I’m sure you will figure out how to mark the poles and connectors for fast set up (see Figure 2 in the post). If winter camping is an option, you will want to heat in the tent. We use a wood stove, which requires a hole in the top of the tent and a tarp to prevent burning pin holes in the canvas. We love the ambiance of the wood burning stove, but have to admit we sometimes wake up coughing because of the smoke in the tent. I think it is more practical in the long run to heat the tent with a propane heater. If so, I think you should consider the type of canvas used by Elk Mountain Wall Tents. I am sure you know that burning propane releases water vapor which will condense on traditional canvas. We have two wall tents. Our newest wall tent was made by Elk Mountain Tents (tell Jordan or Justin I sent you) and uses a lightweight 10 oz. polyester fabric (our 13 x 13 foot tent weighs about 60 lbs – see photo). The polyester fabric is less susceptible to mold and mildew and less likely to absorb water like cotton and the polyester fabric also doesn’t shrink, so you don’t have to guess how much the tent will shrink when cutting the poles for the internal frame. I nailed a piece of the polyester fabric on a post in my garden almost two years ago. It is wrapped around the post, so one side is constantly in the Sun and the other in the shade (damp all Winter long). I looked at it yesterday and except for some dust, it looks brand new. The internal frame of the Elk Mountain tent is also much lighter than our other tent. I was skeptical at first, thinking it would be too flimsy, but it does the job. I noticed in a lot of the images and videos of the elk mountain tents that they seem to let a lot of light in and almost appear somewhat more transparent than the heavier cotton tents. The images of the tents lit up at night really seem to glow. Are these tents easier to see through than the cotton ones? My wife just doesn’t want to be changing at night and have the neighbors all see through, nor have a ton of light coming through in the morning. Thanks! Yes, the canvas is lighter and thinner in the Elk Mountain Tents and they do let more light in and out than other heavier cotton tents, but they are not “see-through”. Never thought much about other campers seeing us, because we’ve never camped that close to someone else. In cases where you do camp close to others, there is a chance you will cast a silhouette against the wall at night with any light in any tent. Awesome! Thank you so much for your quick reply!! If you wouldn’t mind, I did have one more quick question regarding the elk mountain tents: How do you feel it looks and feels compared to cotton canvas? The reason I ask is that we often do revolutionary war reenactments and I’m uncertain if this type of fabric would look really out of place, or could pass for a “canvas” tent very easily? Yes, it looks like normal canvas. But it will not mildew like canvas, so it will always look newer compared to the weathered cotton duck. So if a new tent looks out of place, yes unless you deliberately make it look older. It will also have zippers and screens (if you order them), which are also out of place for historical reenactments.